Keep your belongings close at hand with Richa Designer Panniers. Adorned with red trimming and silver coloured reflective scotchlite panels, these side bags will look great on any bike. With padded rubber feel grippy side panels, and included hooked bungee cords, they keep a secure hold on the Bike. And with comfortable rubber grip carry handles and included attachable shoulder straps, they are just as comfortable accompanying you when you are off your bike as well. Hard semi flexible permanent side supports and included bottom inserts provide extra rigidity which inspires confidence in the panniers ability to perform. The side pockets are perfect for books and maps and the main compartments offer ample room for a variety of cargo. In addition, external zips on the top side of each pannier open up to extend the width up to 10cm, offering flexibility to accommodate a wide range of applications. Don't wait to experience the advantage of these great features, and get the Richa motorbike panniers at GhostBikes today! GhostBikes now stock a full range of Richa Motorcycle Luggage Please click here to see what's currently available. 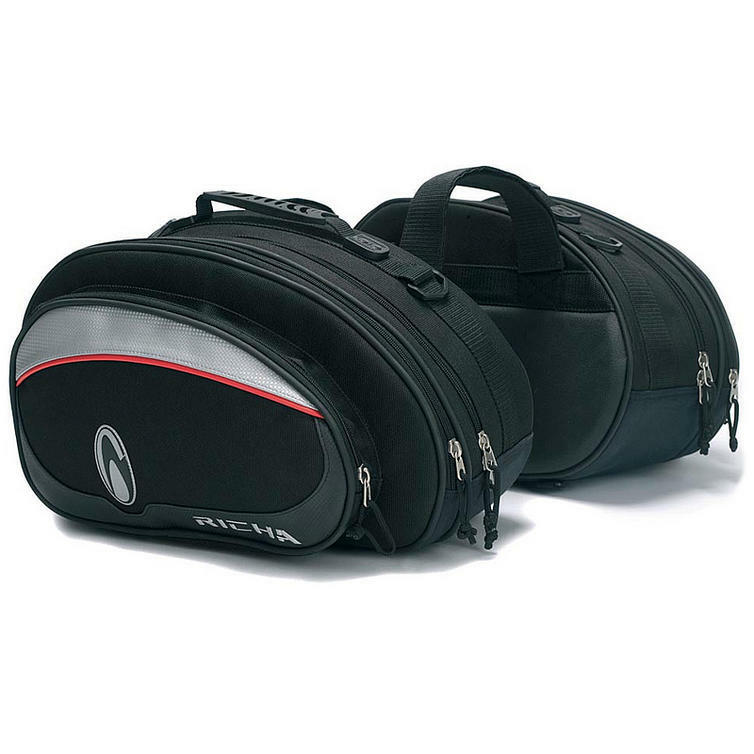 The Richa Expanding Motorbike Panniers are currently available in the colours shown in the picture above.